PIADINA ROMAGNOLA Recipe. Romagna region, Italy. | Travel Blog & Co.
“La piadina, Romagna’s flatbread, is tasty to bite into, wonderful when spread with cheese, an excellent foil for cold cuts, and (when folded) perfect for containing all sorts of things, for example grilled sausages and onions. In other words, it’s an excellent cookout bread. And it’s easy to make! You can halve the recipe if there are just two of you, but you can also make the full recipe and keep half the piadine in the refrigerator (they’ll keep for a week), to cook when needed. If you instead would rather not use lard, you can use olive oil — about 200 ml, or 4/5 cup. 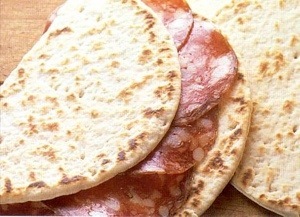 The result will be a considerably lighter piadina. Make a mound of the flour on your work surface, scoop a well in it, and dribble the lard and salt into the well. Mix well, and add enough hot water for the dough to hold together, but not too much. At the most a cup, though do so gradually, because if the dough is too moist you’ll have to add more flour, and that will toughen the dough. Work everything into a ball and knead energetically for 5-8 minutes, or until the dough is smooth and elastic. Because of the lard in the dough, there should be no problems with the dough’s sticking to your work surface. Cover the dough ball with a cloth and let it rest for a half hour. When the dough has rested, roll it out into a snake, divide it into 10 equal portions, and shape them into balls. Take a ball, flatten it into a disk with your fingers, and then roll it out, flipping it and rolling in different directions to make the piadina round. If your first one is some other shape, don’t worry — roundness comes with practice, and a couple of the women who participated (veterans who took advantage of the opportunity to make a snack for their kids) made piadine round as dinner plates, and all the same size. How thick, you wonder? You should aim for 2-3 mm at least or close to a 16th of an inch. Again, because of the lard in the dough, the dough won’t stick to your work surface. Keep rolling until you have used all your balls, putting the rolled out piadine on a tray. As you can see, mine weren’t perfectly round. Next, heat your skillet or testo over a fairly brisk flame until it is hot — a drop of water should dance merrily on the surface — and drop your first piadina onto it. The dough is moist, and with the heat it may puff up. If it does, tamp down the bubbles with a spatula, and continue cooking; after a couple of minutes check the underside, and when it looks done (bone white with dark spots), flip it to cook the other side. 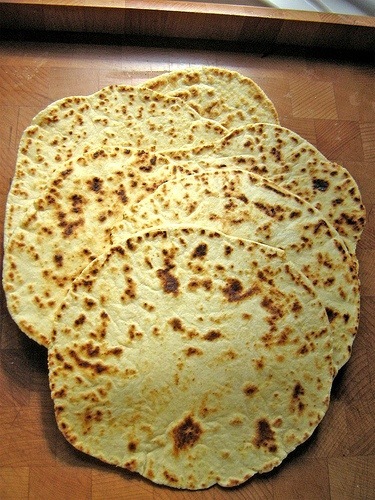 The total cooking time for a piadina is 3-4 minutes, and it is done when both sides look like this. Slide it off the skillet onto a cloth-covered serving dish and cook the next. Sear the piadine you plan to keep for a few seconds on either side, put them in a sealed container, and put them in the refrigerator. Finish cooking them when you need them, and expect them to keep for about a week. This entry was posted in Worldwide Recipes and tagged articles, bertinoro, blog, daily post, food, italy, piadina, postaday, ravenna, recipe, recipes, riccione, rimini, romagna, travel by costanzafabbri. Bookmark the permalink.